Why you should upgrade to Monitors? 1. Ranking History and Alerts on Rank changes features will be soon added to our local SERP analysis tool. Starting with this new release, GeoRanker has started to store all of your past and future reports. In March all this data will become available in your account. 2. Time Saving – with monitors you won’t have to worry about updating each of your reports manually. Use our tool to set the desired update frequency (daily, weekly, fortnightly or monthly) and let us take care of the whole SERP crawling process. February is big month for our team, as it marks one year since we publicly released the first GeoRanker Local Ranking Reports. We are happy to celebrate our first aniversary with the release of My Monitors – a new section in your GeoRanker accounts, that will open the way to an entire set of new features and SERP tools. In this post we are going to introduce you to GeoRanker Monitors and explain why it is important for you to upgrade your old reports to monitors. Monitors are a new type of SERP Reports that can be created only by registered users (including free and paid subscriptions). Compared to our standard reports, they store information about your ranking history, thus enabling you to access and compare SERP reports generated on different dates (this is a feature we are planing to release in May). They also contain the “Update Frequency” feature, through which you can create reports that will automatically update every day, week or month. Monitors can be generated through the same form featured on our homepage at georanker.com. 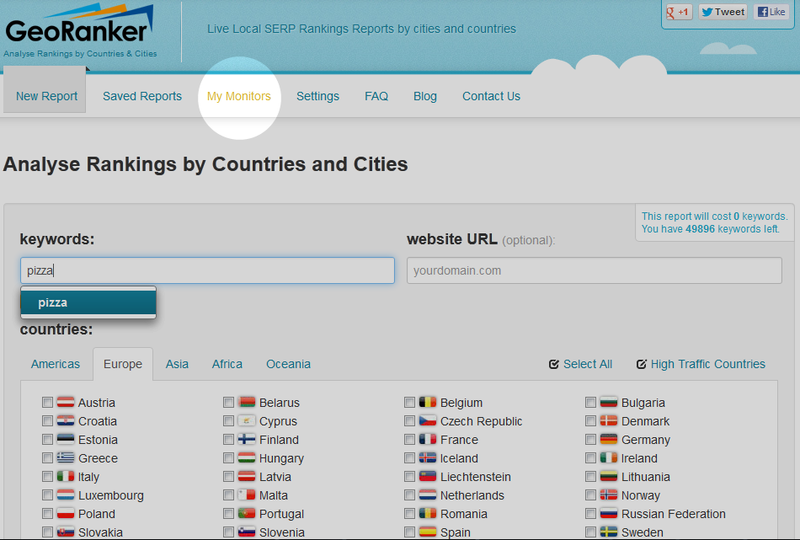 To create your first monitor enter all your usual ranking information: keywords, website URL, country, language and other settings. Once you’re done, scroll down to the end of the form and right before the big “Generate Report” button you will find the settings for your monitor. To find the settings more easier I attached a print screen and highlighted the areas for the report monitor settings (see right photo). 1. Tick the box below “Create a monitor to this report” and GeoRanker will start saving the ranking history for your report. 2. 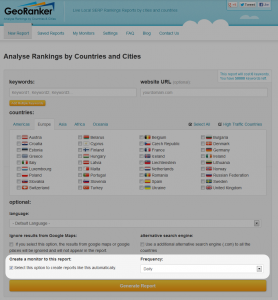 Frequency: use this setting to configure how often you want GeoRanker to update your rankings. Once you have clicked the “Generate Report” button your new analysis will be saved as a monitored search in your account’s MyMonitors section. At the present moment there is no way to convert your old reports into monitors automatically. What you can do is re-generate each report and make sure to save is as monitor (by following the above described steps). Even if it takes some to do so, we highly recommend you to upgrade to the new GeoRanker Monitors. If you find this update useful, don’t forget to spread the news on your favorite SM platforms.